As preparations were being made to build the Memorial, there were those who objected to its erection. 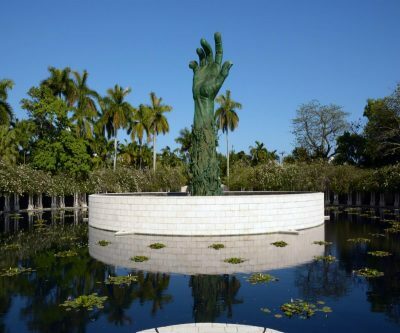 Several disapproved, arguing that Miami Beach was a place for “sun and fun” and the Memorial would be too somber for the vacation destination. “Gloom is doom! Don’t turn one of this city’s few bright spots into a cemetery,” said Miami Beach Garden Club member Florence Shubim. In the mid-80s, the Garden Club had plans to expand their center adjacent to where the Memorial stands, which were quashed by the Memorial’s proposed footprint. Others said the Memorial’s presence on city-owned land violated the separation of Church and State, arguing it was a religious monument. While the Memorial is in memory of the six million Jews who died during the Holocaust, it is a patently historical monument and any religious symbols were removed. On November 27, 1984, approximately 500 people packed a meeting of the Miami Beach Planning Board. Dozens of Holocaust survivors from across South Florida were bused in for the meeting, many making emotional pleas to the Board and hoping to sway votes. Machela Oksenhenbler, 80, pulled up her sleeve to show a grainy tattoo on her forearm bearing the numbers 54092, put there by the Nazis. The Planning Board unanimously approved the Memorial; eight days later, the City Commission also approved plans for the Memorial. The proposed location spanned several city blocks with a physical address of 1933-1945 Meridian Avenue, street numbers that exactly match the years of the Nazi regime and its war against the Jews. The coincidence led many to believe the location of the Memorial was bashert (fate), and also helped convince several city legislators that the Memorial belonged in that specific spot.